You can grow apple trees, even in small spaces. Although many people find that the scent of pumpkin spice reminds them of fall, for others, it’s the sharp, sweet scent of apples that reminds them of the golden days of autumn. A gnarled old apple tree gracing an orchard is a beautiful thing, but so too is a dwarf apple tree tucked neatly behind an urban townhouse or an espaliered apple maximizing limited space alongside a fence or garage. Fortunately for apple aficionados, apple trees are versatile and adaptable, and can be grown in very limited space. While it’s true that you can grow apple trees in small space, it’s important to choose the right space for your tree. That goes for any tree, but even more so for apples. Apple trees require full sun. Morning sun is especially important since it dries the dew from the leaves and prevents rust and other diseases. Make sure that the location where you intend to plant your apple tree receives bright, full and direct sunlight. 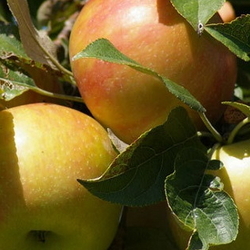 Apple trees can be container-grown or planted directly into the garden soil. They do like sandy loam or sandy clay soil with a pH near 6.5, so have your soil tested by your local Cooperative Extension Office to get their recommendations for improving it before planting trees. Pruning often confuses newcomers to the world of growing apple trees, but pruning apples can be learned. Most trees are pruned with a central leader or trunk and extended branches. The branches should look like rungs on a ladder. For more on pruning apple trees, see the North Carolina Cooperative Extension site. 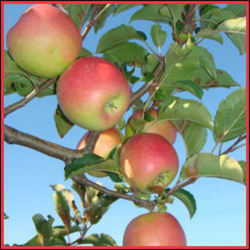 Apple trees are designated at dwarf, semi-dwarf, and standard sizes. This doesn’t refer to the size of the fruit but to the mature tree height. For small spaces, your only choice is dwarf. Semi-dwarf and standard size trees will just grow too large for tiny spaces. Trees can be purchased as whips, container-grown trees or balled and burlapped trees. Whips look like skinny, rootless sticks. They’re the least expensive but the most difficult to raise to maturity. Plant whips in March or April. You’ll need to plant them, stake them, and train them to grow straight and tall using one or more gentle guidelines to the stakes. Make sure that the tree has flexibility in the wind. The trunk can and should sway slightly when staked. If it doesn’t, the tree will never put down strong roots to support itself, and when you remove the stakes, it will have a weak trunk. Container-grown apple trees are the easiest for the novice to plant. Dig a hole about as deep as the container. Look for the soil line on the trunk of the tree. Plant it as deeply in the ground as it was in the container. Don’t try to plant it any deeper. It won’t help the tree, and in fact may encourage the original root stock to send up suckers. 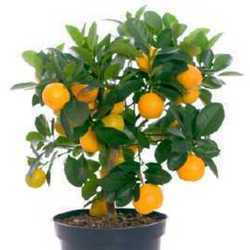 Most fruit trees are grafted onto strong, standard root stock. B and b, or balled and burlapped trees, are dug from fields and their roots wrapped in burlap cloth and twine. While these trees may be large and robust, they may go into shock from being moved to their new home. Always remove the burlap and twine before planting. While it’s true that burlap rots in the ground, it can also girdle the roots and prevent them from spreading out. It’s quite safe and in fact encouraged by many horticulturists to take off the burlap wrap from the roots. Apples are one of the world’s oldest cultivated fruit trees, and there are at least 7,500 known varieties in the world today. Not all grow well in every climate, however, and each has its uses. Some produce apples for fresh eating, some for cider, some for cooking, and others for long storage. Stores tend to stock apples that withstand shipping and transportation and are good for fresh eating, but there are many, many other varieties to choose from. Know in advance how you plant to enjoy your harvest. This will help you choose varieties for your garden. The easiest way to learn which varieties grow well in your area is to visit your local Cooperative Extension website. They should have a list of varieties for your region. Some apple varieties also offer better disease-resistance than others. Many apples succumb to fire blight and rust, two diseases which can destroy a mature tree in one season. It’s better to plant disease- resistant varieties than to fuss with cures later. Lastly, apples are “self incompatible.” This means that you need two different varieties of apple trees that bloom around the same time in order for pollination to occur. They have to bloom around the same time so that bees and other pollinators visiting one tree transport pollen to another. For small space gardens, look for dwarf trees with multiple varieties grafted onto one trunk. Nurseries have produced such trees so that small-space gardeners can enjoy fresh apples from just one tree without having to worry about finding another pollinator. These trees take up the same amount of room as a typical dwarf tree, but produce fruit because they bear pollen from two different varieties. The technique of ‘espalier’ means training the boughs of a tree to grow against a fence or wall. Ancient Egyptians actually trained fig trees in the espalier method, and gardeners throughout the world continue to train fig, pear, cherries, peaches, and apple trees along wires, fences and trellises to maximize yields in small spaces. It can take up to four years of careful pruning, training (tying) and nurturing to get your espaliered apple tree to look its best and produce fruit. Traditional espalier patterns include horizontal, fan, candelabra, and Belgian lattice. Plant trees about six to 10 inches away from the wall surface. As with any apple trees, espalier trees need full sunlight, sandy loam or sandy clay soil with a pH of 6.5, and good drainage. During the winter, major pruning encourages bud development.Spring or summer pruning shapes the branches into the desired form. Wires or lattice work may be placed on the wall before planting the trees. The tree’s branches can be gently tied to the lattice to help them grow into the desired shape. For more information on espalier pruning, see this article on the Chicago Botanical Garden website. No matter how small your yard, if you have room to plant a tree roughly the size of a dogwood, you can plant an apple tree. Just remember to make sure it receives full sun and to find one that has two or more varieties grafted onto it in order to get fruit and you’re on your way to enjoying fresh apples.